I suggest we start our conversation about wedding skirts and petticoats from discussing their simplest kinds. 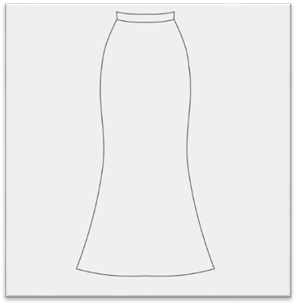 They are straight skirt, A-line (bell-shaped) skirt, A-line fishtail skirt, classic fishtail skirt, and flared skirt. There are lots of techniques for constructing straight skirts, lots of methods for taking measurements, fitting, calculating darts, etc. I will not focus on them in this course because they have been described in great detail by other authors. Besides, I have to say that the classic straight skirt is not something you see very often in wedding fashion. For this reason, I will start from the A-line or bell-shaped skirt. Let us take a look at its pattern. You can see the A-line skirt pattern drawn in half the actual size on the writing board. I purposely made it half the actual size because we are going to work with a half-scale dress-form to make a mock-up and polish up the shape of the skirt. And it is simply easier to demonstrate everything on a small pattern. I have been using this pattern for about 20 years. I bet you will be surprised by the fact that the same pattern is used for the back and for the front of the skirt if you see it for the first time now. The thing is that I use it as a template to draw a custom pattern for the client. This pattern includes seam allowances: 2cm along all vertical edges and 1.2cm along the top edge and along the bottom edge. The half-scale pattern has 1cm and 0.6cm seam allowances correspondingly. 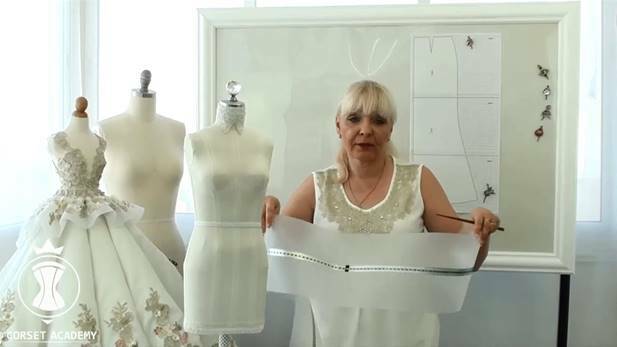 Let us imagine that our client’s figure fully corresponds with the shape of our half-scale dress-form and adjust the initial pattern based on its parameters. First of all, I measure the initial pattern along the waistline, the stomach line (about 12cm below waistline), and the hip line. Please note that I purposely made no notch at the hip line level on the initial pattern because you must determine this level yourself on your client’s body. I want to show you a very precise and widely used way of measuring the Hip Circumference with an improvised “wide measuring tape.” You take a wide strip of paper or plastic and stick a measuring tape on it. I recommend you always use it for measuring Hip Circumference from now on. It will allow you to simultaneously measure the thighs and the most prominent part of your client’s stomach, which will make the Hip Circumference measurement a lot more precise. To take this measurement, I find the widest part of the client’s body (the half-scale dress-form in our case) below the waistline. It is the hip line level. In my case, the hip line is situated 18cm below waistline and the half-scale Hip Circumference is 47cm. - And I shift the side seam line 2cm towards the back of the skirt if the Hip Circumference exceeds 116cm. - Skirt Length – 110cm (55cm). First, I will do all pattern adjustment calculations with the actual (full-size) values. And then I will divide the resulting values in half and apply corresponding adjustments to the half-scale pattern. You will see the entire adjustment process. The first thing I need to do to calculate adjustments to the pattern is determine the position of the side seam and the widths of all darts. It is compulsory to add 2cm looseness along the hip line in the A-line skirt like ours. I know it from personal experience that many clients ask for a very tight-fitting skirt hoping it will re-shape their figure in a flattering way. In reality, it is very uncomfortable: the skirt keeps wrinkling and the wearer feels very awkward. Even if your client insists on a very narrow skirt, I still recommend you should add that 2cm looseness during the cutting. You can always narrow it down later if necessary. 47cm + 1cm = 48cm. 48cm – 37cm = 11cm. The aggregate width of all darts is 11cm in our case. Keep this value before your eyes! Since my client’s Hip Circumference is 94cm, I do not shift the side seam line. It stays just how it is. Now, let us distribute the aggregate dart width between the side dart and the darts at the front and at the back of the skirt. There is 5.5cm left from the initial aggregate value. I divide it in three. Two thirds will fall upon the back dart and one third − upon the front dart. Hence, the front dart has a width of 1.8cm. And the back dart has a width of 3.6cm. It is highly recommended to split the back dart in two separate darts if its width exceeds 2.5cm. It is better in terms of technique because it will be easier to sew and press two darts rather than one (the seams will settle down flat and not stick up). It is also better with regard to the fit: as you know, the more princess seams or darts there are, the smoother the shape of the garment is and the better it fits the client’s body. So I divide our 3.6cm wide back dart in two darts, each with a width of 1.8cm. I write all dart widths on the writing board: side dart (5.5cm), two back darts (1.8cm each), and one front dart (1.8cm). This means I will mark 2.7cm either side of the centre of the side dart and 0.9cm either side of the centres of the front dart and the two back darts. We need to divide these values in half for the half-scale pattern, i.e. mark 1.3-1.4cm for the side dart and 0.4-0.5 for the front dart and the back darts. Now let us talk about the positions of the front dart and the back darts. 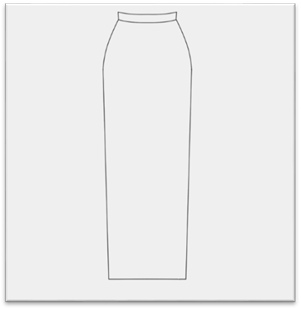 According to the theory, a classic type skirt has side darts with an average length of 14-16cm. If your client has narrow hips, it is better to shift the back dart 1-2cm closer to the side seam line, and if she has full hips, then you should, on the contrary, shift it 1-2cm closer to the centre of the back. The front dart is 9-11cm long. It is better to shift it 1-2cm closer to the side seam line if your client has a flat stomach or 1-2cm closer the centre of the front if she has a bit of a belly. The initial position of the front dart is found by dividing a half of the front in half and the initial position of the back darts − by dividing a half of the back in three equal parts. A good look at your client’s figure will be enough to estimate whether she has a flat stomach or a prominent belly and how wide her hips are. And then you can decide whether you need to shift the darts closer to the side or closer to the centre if at all. There are, in fact, a great many theories, methods, and discussions on how to construct these darts and the top edge of the straight skirt and the bell-shaped skirt, but I will not focus on them here as I said before. I will show you how to adjust the front and the back of our pattern and then we will move to other skirt types.